Living in Southern California affords us nearly year-round alfresco dining. However, with the rest of the country in mind, now is the time that people are stringing strands of paper lanterns across gardens and power washing their patios. Replacing patio furniture can be a huge expense, especially while on slim budget. 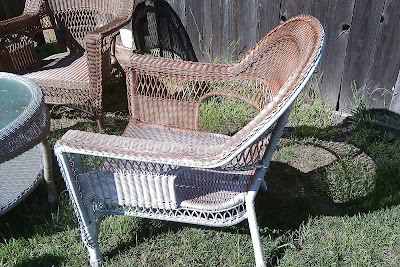 Garage sales and Craig's List are often the answer for those of us without a secret hedge fund, like myself, who scoured the usual sites to no avail as sums passing $1,500 for a new ensemble appeared the norm. After weeks of searching, I did find a six piece set that needed a face-lift, but would be well within my scope of talents – i.e., trigger finger friendly spray paint and elbow grease. I purchased the four chairs, umbrella (sans base), and coffee table from a woman in Huntington Beach for $125, who originally paid over $800 for the Martha Stewart set at Kmart. The set was an interesting grey/beige yellow combo – in theory a great combination. 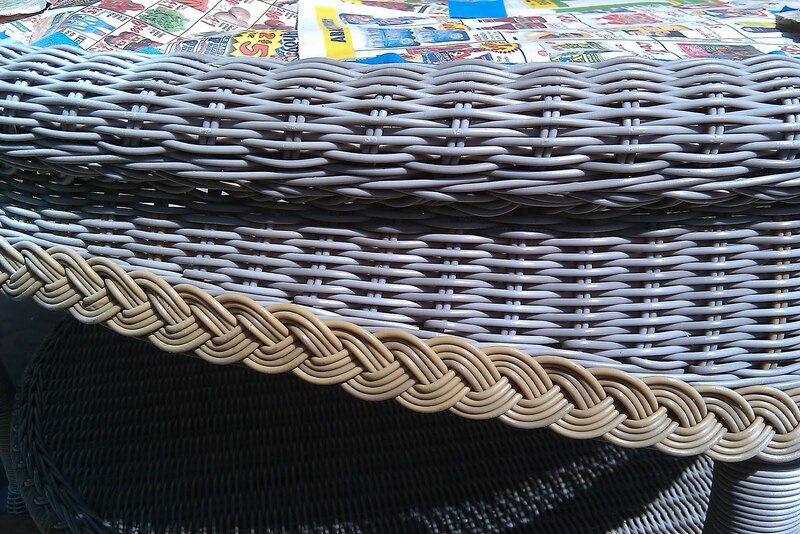 Those tones on a patio set, not so much. After a good scrub, a layer of primer, and three coats of Rust-Oleum Metallic Bronze spray paint, we've got ourselves a new-to-us patio set. The cushions that came with my original purchase were a paisley-floral pattern, matching the umbrella, but rather sun-bleached. Once again after scouring the Internet and all home improvement stores in a 15 mile radius for a solid color that would go with the umbrella’s color scheme on a deep-seated cushion, I came up empty handed. Naturally, I assumed this product that fit my specifications would be out there – and it was, at a premium. This story does have a happy ending – on a routine trip for fillets at Costco I passed their legendary line of random products at the entrance and stumbled upon 20" aqua pillows, in a two-pack, for $15 each. 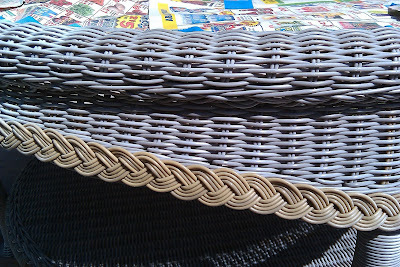 Sold, to the brunette for $30, and the old seat cushions were left in the dust. With a little elbow grease, a lot of research, and a little luck when you are least expecting it, even the most insipid patio furniture can be turned into your backyard’s most appealing feature. Time to fire up the barbie.